WASHINGTON, D.C. - The U.S. Consumer Product Safety Commission, in cooperation with the firm named below, announced a voluntary recall of the following consumer product. Consumers should stop using recalled products immediately unless otherwise instructed. It is illegal to resell or attempt to resell a recalled consumer product. Description: The recalled products are 2.5 PSI pumps with model numbers 57-1504-A and 57-1504 that are used to inflate low pressure inflatable items such as rafts and toys. The Model No. 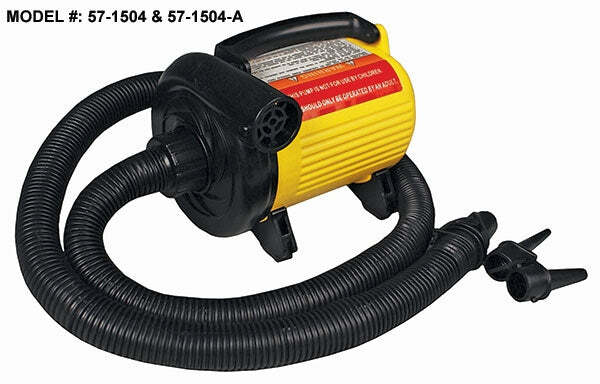 57-1504-A pump was sold separately with an assortment of interlocking nozzles to adapt to a number of needs. The Model 57-1504 pump was sold with the Sportsstuff Launch Pod, an inflatable water trampoline sold under Sportsstuff number 58-1002. The model number and the date code "0104" are located on the Underwriters' Laboratories label on the top of each pump. "2.5 PSI" was not written on the air pump, but was written on the packaging. Sold through: Marine distributors, mail order catalogs, and sporting good and various other stores nationwide from January 2004 through January 2005 for about $50. The Launch Pod water trampolines that included recalled pumps were sold at Sam's Club from January 2004 through August 2004 for about $375.